John and Peggy Heap, and family, moved to Harston in April 1968 when Sarah was 6, Alice 4 and Thomas 2. We moved into the Old House, High Street, which had previously been occupied by the Reverend and Mrs Bisseker. A good selling point of the house was that it was good for playing hide and seek. Alice can remember many different cupboards big enough to get in, and other nooks and crannies including a door in the attic that allowed you to climb into the roof-space. We bought the house for £8000 and there was a lot of work needed. The roof leaked, the electrics needed doing and heating putting in to make the house more comfortable, but we retained much of its original character. The old house was built in 1610, but had many alterations over the years. The Bissekers who moved to the house in 1930 added a study and a bedroom above. In 1970 we removed the chimney, put in a large window and left the study as a room lined with bookshelves. We made the further addition of a playroom with bedroom and bathroom above, finished with a flat roof. Mr Fred Willers, from Button End, was the builder. Most children at school knew the Old House was one of the few houses with a ghost story. It is said the lady ghost was seen twice, the last time in 1913 by a nursery maid. Noises were often heard of doors being unbolted, loud knocks or angry voices. The Rev. T H Bisseker exorcised the ghost in the 1930s and since then no-one has been heard. To the right of the drive were outhouses and there was also a privy in the garden and a large barn, which was moved from Button End by the Hays family in 1848. In the garden was an air-raid shelter we used for storing apples. Alice recalls good climbing trees at the front of the house. Also in the front were 2 large horse chestnut trees which produced a lot of conkers which the children used to collect. Behind the house was a flat area, previously a grass tennis court. John mowed paths through the overgrown orchard, at the back. When the children were young, we took in a series of lodgers, several connected with the Veterinary School (Gerry, Jonathan and Roderick). We also fostered Anna Cusnir from Romania who was brought to the UK by Children’s Relief International. She went to Melbourn Village College and was good friends with Debbie Blake, who lived on Station Road. We remain in contact with Anna, who now lives in Vienna. The children went to school in the village. Mr Peter Shoote was Headmaster at the time. He lived in Newton. Mrs Wheatley taught Class 5, Mrs Percival Class 4, Miss Radmore Class 1 (now called Reception). Thomas was taught by Mrs Ashkam. Alice said Mr Shoote was a strict, but a good and interesting teacher, if old fashioned in his suit and tie. The children enjoyed nature walks with Mrs Percival. To start off they used the big room in the old part of the school as a hall, but Alice remembers the main hall being built. The hall was used for gym, where they had climbing bars. Outside they played rounders. Alice’s good friend Tracey Hughes was very sporty – she lived in Hauxton. A lot of Hauxton pupils came to Harston during 1968-1975. The swimming pool was already there and Alice’s fair-haired friend (Laura Knight) had her hair turn green from the chemicals in it! School education was going through a real change during this time. Sarah took the 11 Plus and went to the High School for Girls in Cambridge. The 11 Plus was then abolished and Alice went to Melbourn Village College. Thomas went to Kings College Prep School. Soon after we arrived in Harston, Harry Lawrance, the Blacksmith, came over and invited John onto the Village Hall Committee. John continued to be involved with the Village Hall for the rest of his life, giving more (or less) of his time, as work permitted. He felt it was very important to village life and oversaw many improvements. He was also Governor of Melbourn Village College for a period and elected District Councillor (Lib Dem) for Harston, Newton and Hauxton in 1998. He was still in office when he died in March, 2006. After reading an article about the need to help village residents get to the doctor’s surgery, I started a Harston Social Car scheme in 1991 and ran it for 20 years. It continues to this day and provides an excellent (and much needed service). In 2001, John and I started the Warden Scheme. The object being to support elderly residents to remain in their own homes with a daily phone call and a visit, at least, once a week. Council tenants, at that time, had their own warden. Our first excellent Warden was Mrs Sharon Isted. I’m delighted that this scheme has gone from strength to strength under the chairmanship of Mr John Cowan (formerly of the High Street). I also did Meals on Wheels. The meals were provided by Fisons (Bayer of Hauxton) and kept hot in a box into which we put hot charcoal. The box would contain a 2-course lunch which was greatly appreciated by the recipients. Mrs Sylvia Crowe, of Beech Farm, was my very nice assistant. The Lunch Club started in the village in 1976. Monday was chosen as there was an over 60’s club operating on a Monday afternoon. 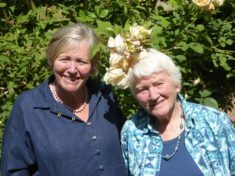 Iris Armstrong and Vida Fletcher were instrumental in getting this organised and it still flourishes, on average cooking for 40 people every Monday. I much enjoyed my involvement with the Lunch Club over many years. I joined the Harston WI as soon as we came to Harston and met many nice people. In the early days we enjoyed amateur dramatics. Yvonne Nutcombe was a star as was Daphne Burl, wife of Ed, who ran the Post Office. We had a lot of fun. 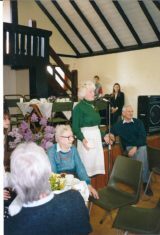 Sarah was involved with the Linden Players Drama Group which was based at Fisons Clubhouse in Hauxton. Paul Allingham was the organiser. Alice did Brownies in Haslingfield and later Guides, in Harston, led my Mrs McDermott and Mrs Joyce Wilkinson. Colonel and Mrs Hurrell opened their garden at Park House for the village fete in the late 1960’s and 1970’s. There was a small kitchen which they used for the teas, which smelt of leather and dogs! In particular, Alice remembers the fancy dress competition, where she went dressed as a strawberry! The Harston Horkey, a Harvest celebration, was held in the village hall. Much beer was consumed, and Denys Owen was the caller for the dancing. There was no playground in the village when the children were young, so they used to go to Whittlesford. At Christmas, Albert Hearn provided a tractor for carol singers (sitting on haybales) to go around the villages. Alice went to learn riding with Miss Eileen Hays at Baggott Hall Farm. She was a tall, straight, elderly lady who lived in a house where Orchard Close now is. Miss Hays was an excellent teacher and Alice really enjoyed it. They would ride all round to Newton. There was also a Riding School next to Park House run by Miss Pritchard. Mr Horseman ran a grocer’s shop at 29 High Street. Next to him was a hairdresser’s and a toy shop. At 51 High Street, the Knights had a grocery shop which later became an antiques/furniture shop. George and Mary Knight had 2 daughters, Jane and Laura. There was also Church Street stores, run by Colin and Jean Samson. Sarah worked there on Saturdays from the age of 14. There was also Vera’s Shop on Royston Road. She sold toys, sweets, haberdashery, downstairs and clothes upstairs. Alan Mills ran the garage (now BP) and Andy Bowden delivered milk in Harston and the surrounding villages – he did his rounds on foot, walking many, many miles during this time. Henry Oakman and Gerald Ives were the local postmen. During her sixth form year, Alice helped deliver at Christmas and remembers the long High Street drives being slippery and treacherous. Opposite Harveys Nursery lived Mrs Audrey Northrop, who was a great needle-woman and a very lovely person. There were 5 pubs in the village – The Coach & Horses, The Pemberton Arms, The Old English Gentleman, The Queens Head and The Three Horseshoes. I hope this gives some idea of life in Harston in the latter part of the twentieth century.